Decorate your tables with our lovely Brand New Polyester Table Skirts! Whether it's a grand party or just a social gathering with friend and family, our table covers will be perfect for your event. Wrapped around the sides of the tables, those old or unsightly legs of the tables will disappear out of sight! Available in a variety of colors and sizes. Each table skirt measures 21 feet x 29". 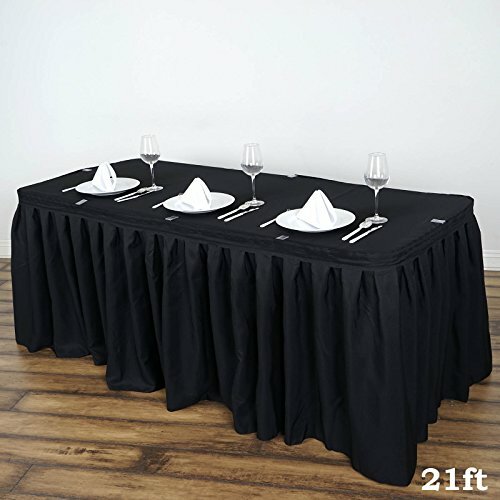 This table skirt is able to cover 4 sides of a 8' by 2.5' standard sized banquet table - 24+ table clips suggested. All table skirts come with velcro on top for attachment to clips. 1" wide velcro is attached along the whole length of skirt top. TABLECLOTHS AND OTHER DECORATIONS ARE NOT INCLUDED. PLEASE NOTE: The colors of products when viewed on your computer monitor may appear different than the actual color of the merchandise. We make every attempt to give you a good representation of the available colors for each product sold, but unfortunately we cannot guarantee an exact match. Dye lot variance of 1 to 2 shades is considered normal. FREE SHIPPING on orders $100 and more. Brand New Condition. All orders are shipped from California. Take advantage of our special offers and discounts. No coupon code required. Available in a variety of styles, materials and colors. Perfect for weddings, receptions, parties, catered presentations, bridal and baby showers, birthdays, candy buffets, dessert tables and more. Pair this with other BalsaCircle decorations, such as backdrops, chair covers, centerpieces, lighting, DIY craft supplies and fabrics. If you have any questions about this product by BalsaCircle, contact us by completing and submitting the form below. If you are looking for a specif part number, please include it with your message. © 2019 - diningbench.org. All Rights Reserved.